Includes microfiber detailing towel and foam applicator! Lavish your leather in a gentle cleaner and rich moisturizer from Pinnacle. The Pinnacle Leather Combo pampers your leather seats with two of the finest leather care products in the business. Pinnacle Leather & Vinyl Cleaner gently cleans leather without drying. Then use Pinnacle Leather Conditioner to nourish and protect leather. Leather upholstery and goods will look and feel soft and sumptuous with regular use of the Pinnacle Leather Combo. Pinnacle leather care products were developed for the unique needs of auto leather. Leather seats are exposed to friction from passengers sliding in and out of the vehicle, UV rays, and body oils. Pinnacle's leather products are designed to safely remove body oils and other contaminants, and then restore the moisture lost through day to day wear. 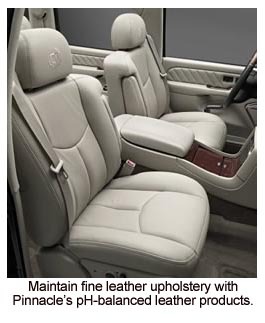 In two steps, your leather upholstery will get pH-balanced care that preserves its beauty and flexibility. Leather & Vinyl Cleaner will remove just about any stain from leather and vinyl. Natural citrus cleaners penetrate deep into every pore to gently lift out dirt, grease and oils. The toughest stains wipe away leaving only a fresh lemon scent. Pinnacle Leather & Vinyl Cleaner cleans leather without over-drying. Pinnacle Leather Conditioner nourishes leather with a rich formula of lanolin and natural oils. These oils quickly absorb into the hide leaving a non-greasy, satin finish that actually repels dirt and moisture. A subtle fragrance compliments the leather’s natural aroma. Pinnacle Leather Conditioner armors the leather with strong UV protection. Regular use prevents drying, cracking, and fading. You'll love what the Pinnacle Leather Combo does for your vehicle's leather seats! Regular use will keep the leather looking clean and feeling soft and supple. Vacuum your seats and interior to remove loose dirt. Mist a damp towel with Pinnacle Leather & Vinyl Cleaner and massage into the upholstery. Particularly soiled areas may require agitation with an upholstery brush. Wipe away excess cleaner with a clean, dry Super Plush Deluxe Microfiber Towel. Apply Pinnacle Leather Conditioner with a soft cloth, sponge or your bare hands. Massage the lotion into the leather. Allow the conditioner to penetrate for several seconds and then buff with a clean, soft microfiber towel, such as the Microfiber Detailing Cloth. A total retail value of $67.96. Save $17.97! I detailed my bride's Buick Enclave which has all-leather interior. The cleaner made quick work of any oils etc. on the steering wheel and seats & interior components. The next step was to condition the leather and protect it. The conditioner leaves a wonderful smell behind and gives the vehicle a pleasant new car smell (in my opinion). Best of all the leather is left clean, conditioned, and feels dry to the touch after. The combo package was really nice-everything you need to start working on your car. I really liked how they did not effect the new car smell of the leather. Used it on seats in 2006 Azera and also 64 Corvette convertible. Could see the dirt on the applicator with the vette seats but not on the Azera. Different leather. Was very easy to apply and had pleasant odour to it as well. Will continue to use and see how it preforms on dash and seats. Use on a brand new 2016 Jeep Sahara. The product works great but I heard another premium brand leaves more new leather smell.